DNA Day commemorates the completion of the Human Genome Project in April 2003 and the discovery of DNA’s double helix in 1953. To learn more about it, check out the National Human Genome Institute’s website. Each year to celebrate DNA Day, the testing companies offer sales. If you have not yet tried DNA testing for genealogy or if you have more people you want to test, now is the time! The sales offered this year seem even better than those offered during the last holiday season. 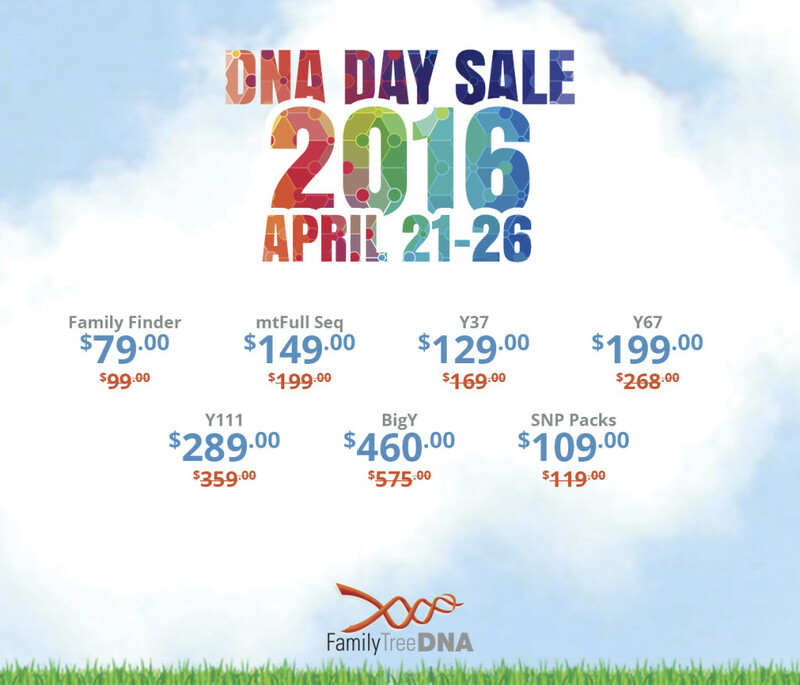 Family Tree DNA is having a sale April 21 – 26, 2016. What great deals! That’s one of the best prices we’ve seen on Big Y! Stock up now on your Family Finder autosomal DNA kits for only $79 and get Y-DNA tests done for those male relatives. I suggest starting with a minimum of Y37 but more is often better and those are great prices on Y67 and Y111. The sale will extend through Tuesday, April 26, 2016 (11:59 PM Central), and will be limited to new tests or add-ons. Upgrades will be discounted in June. Family Tree DNA is also offering a fabulous price on the mtFull Sequence. If you’ve been on the fence about it, now is a good time to check it out. This test is best used for solving specific research problems but I think I’m going to order one for my mom out of sheer curiosity. Many people are finding mutations between mother and child and inquiring minds — OK, maybe just my own inquiring mind — wants to know if my mom has the same rare mutations that I do. Ancestry.com is also having a sale until April 26th! You can use the coupon code FREESHIPDNA for free shipping. It’s a great time to stock up! You never know when you might find a relative who agrees to test. Having a spare test on hand has come in handy many a time! We have not yet heard of a sale from 23andMe but if information comes out, I’ll keep you posted!